Originally installed as a grand entrance to Buckingham Palace, John Nash’s arch was moved to its current location, what is now effectively a traffic island not far from Speaker’s Corner in nearby Hyde Park, in 1851. The story goes that this took place after it was discovered that the arch was too narrow for the widest of the new-fangled coaches but there are some doubts over this, particularly as the gold state coach passed under it during Queen Elizabeth II’s coronation in 1952. Another story says that it was moved after extensions to Buckingham Palace left insufficient space for it. Work on the arch had started at Buckingham Palace in the mid 1820s and it was completed by 1833. 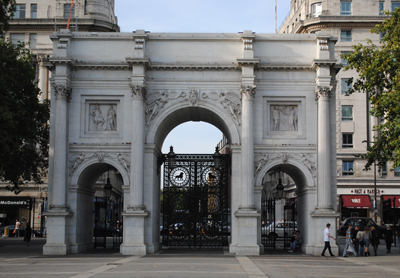 It was originally moved to replace Cumberland Gate as the new entrance to Hyde Park and to complement Decimus Burton’s arch at Hyde Park Corner. Successive roadworks in the 20th century, however, left it in its current position. Clad in Carrara marble, the design of the arch was inspired by Rome’s Arch of Constantine and the Arc do Carrousel in Paris. The sculptural ornamentation, which includes works by Sir Richard Westmacott and Edward Hodges Baily, however, was apparently never completed and an equestrian statue of King George IV, originally destined for the top of the arch, instead now stands in Trafalgar Square. The bronze gates – which bear the lion of England, cypher of King George IV and image of St George and the Dragon – were designed by Samuel Parker. Only senior members of the Royal family and the King’s Troop Royal Horse Artillery are permitted to pass under the central arch of the monumental structure. The arch stands close to where the Tyburn Tree once stood (for more on this, see our earlier post). It contains three small rooms which, up until the 1950s housed what has been described as “one of the smallest police stations in the world”. There was some talk in 2005 that the arch would be moved to Speaker’s Corner but this obviously hasn’t eventuated. For six centuries, the gallows at Tyburn, in the city’s west, was one of London’s sites of public execution. Today, little remains to remind visitors of the infamous past of the area, which lies close to Marble Arch, but for a plaque set in the middle of a road. From 1196 to 1783, it’s suggested that thousands of people (some have estimated as many as 60,000) were hanged at various gallows erected at Tyburn, known by numerous names over the centuries including ‘The Elms’, the ‘The Deadly Never Green Tree’, and most infamously the ‘Tyburn Tree’. 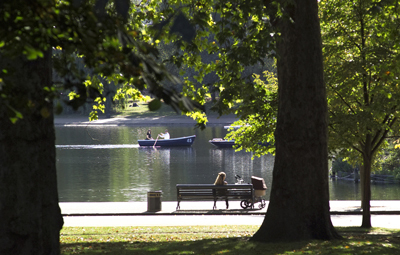 Hangings were apparently initially carried out using the branches of a tree on the bank of the Tyburn River but the first gallows date from 1220. In Elizabeth times these were upgraded to a larger gallows known as the ‘Triple Tree’ which enabled many more people to be hanged simulteously – as many as 24 at once in 1649. The gallows was removed in 1759 because it was blocking the road and a mobile gallows used until hangings were moved into Newgate Prison (see our earlier entry on Newgate). Executions were a public spectacle and it’s estimated that at times the crowds at Tyburn swelled to more than 50,000 people, all eager to witness someone “dancing the Tyburn jig”. Among those to be hanged at Tyburn were William Fitz Osbern (a champion of London’s poor who was hanged in 1196), Roger Mortimer, 1st Earl of March (hanged in 1330 after being accused of assuming royal power), Perkin Warbeck (pretender to the throne of King Henry VII who was hanged in 1499), and Elizabeth Barton, the ‘Holy Maid of Kent’ (hanged for treason after prophesying King Henry VIII would die within six months of marrying Anne Boleyn). Others included key figures in the so-called Pilgrimage of Grace (an uprising in England’s north in 1536 which followed King Henry VIII’s break with Rome) and many other Catholics including Oliver Plunkett, the Archbishop of Armagh and Primate of all Ireland (1681). In an unusual move, the body of already deceased Oliver Cromwell, along with that of John Bradshaw and Henry Ireton, was exumed from his grave and and hanged there to mark the first anniversary of the Restoration. 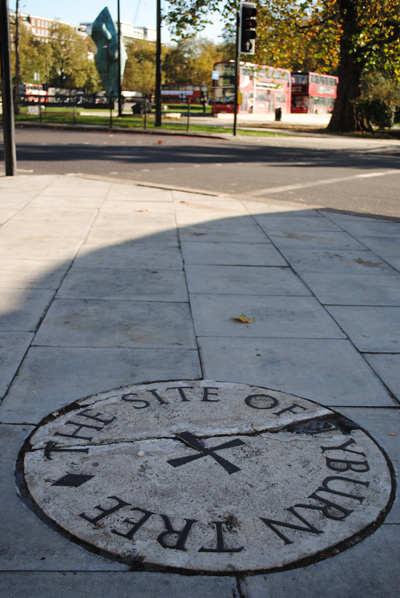 What is believed to have been the site of the Tyburn Tree is today marked by a plaque set in a traffic island at the corner of Edgware Road and Bayswater Road (nearest tube station is Marble Arch). 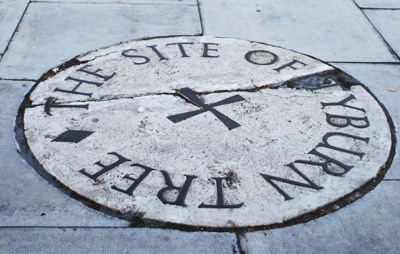 There is a Shrine of the Martyrs dedicated to the more than 105 Roman Catholics who were hung at Tyburn for their faith at the Tyburn Convent in Hyde Park Place (for visiting details, see www.tyburnconvent.org.uk). Note: This article originally referred to the Shrine of the Martyrs commemorating more than 350 Catholic martyrs who died during the Reformation as all being executed at Tyburn but it is believed some 105 were – the greater figure refers to those martyred across England and Wales during the Reformation.